As I mentioned in various posts as of late, Anny is now a runner too. She has become my running protege. Anny came from a completely non-sporting background, so she has done really well to build up the frequency and duration of her runs without suffering any injuries. Unlike myself she is rather sensible and doesn't tend to overstep her limits. She knows when enough is enough. She decided to enter herself in a race whilst we were in Madrid last weekend. Originally she wanted to do a 10k race, as she has been following some 10k race training plans for some months now (back to back), but the 10k race she wanted to enter was full, so she registered for a 5k race instead. The race she entered took place on Saturday 26th May in a small village about 40 minutes drive out of Madrid called Cerceda. There were about 300 people running in the race, and most of them were women, since the race was held in aid of an organisation called "mujeres en accion contra la violencia de genero" (women in action against domestic violence). The weather was pretty hot, and it was over 30 Celsius for sure. Even walking around I was sweating a lot, and there was no breeze at all. The conditions were not ideal for running a race, and it probably would have been better to schedule the race in the morning when it was cooler, but c'est la vie as they say in French. 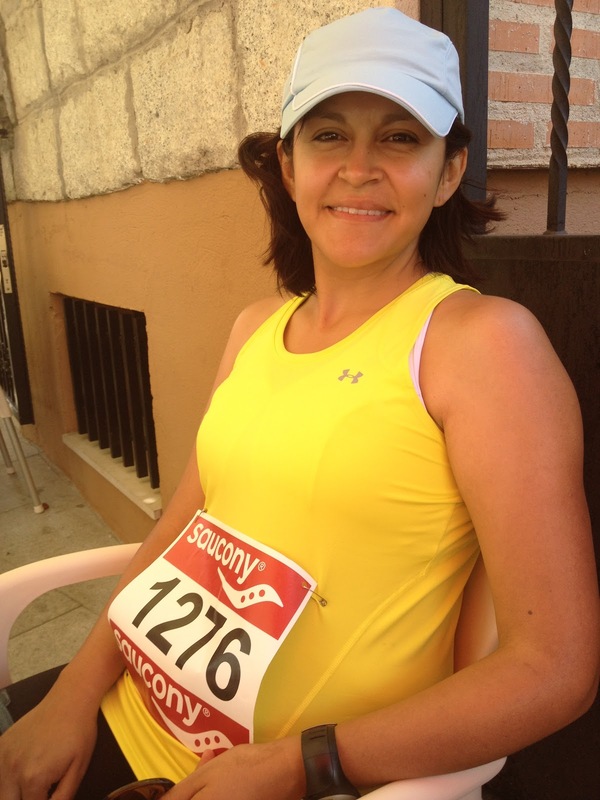 We arrived in Cerceda one hour before the start as Anny had to collect her race number. The race was only 6 EUR or so to enter, so it was not that surprising that the organisers did not give out any timing chips. Basically it was down to each runner to record their own time. We (the Anny Pinto supporters consisting of her mum, myself, Negrita our dog and Punkita who is the mother of Negrita) went to a cafe whilst we were waiting for the start, and I had a little talk with Anny about what it is like to run in a race and the importance of pacing and not going off to fast because of the adrenalin factor etc. With ten minutes to go we headed over to the start, and Anny found a good spot in the pack, ready for the off. The start consisted of a piece of cordon tape held up by 2 officials, and after a 10 second countdown the runners were sent on their way. I watched her for the first few hundred metres and then she went out of sight. After that we tried to find a place about 350 metres away from the finish so that we could cheer her on in the final stages of the race. I had anticipated she would finish in between 25 and 30 minutes, but I was hoping for closer to 25 minutes as she has run under 30 minutes in training with me before. I kept looking nervously at my watch as the elapsed time passed 25 minutes. Shortly afterwards I saw her coming over the brow of the hill and her mum and I gave her a huge round of applause. She looked strong. I started running alongside her with Negrita, trying to get her to push as hard as she could for the final few hundred metres. I was wearing my formal work shoes so not the ideal running footwear, but as the distance was short it didn't really matter. Anny was basically sprinting the final hundred metres and she overtook quite a few tired runners on the home straight. Her final time was 27 minutes, plus or minus a few seconds. She was in the top quarter or so of the field, and the course apparently was not that easy. On top of being very hot, she told me that there were quite a few hills and also an off road section. Everything considered it was a fantastic result for her first ever race. Anny really enjoyed the experience and now wants to do a 10k race, followed possibly by a half marathon at the end of this year. Keep it up Anny!!!! Are you a runner? Can you remember your first race and how it felt? Or maybe you are planning to do your first race soon? On the other hand perhaps races don't interest you? Well done Anny! The running bug has now bitten you so you will be striving to do better and better. Then when you are older like me the competitive edge leaves you. Awe congrats Anny that is such a good time! I did my first 5K this year and I was so nervous before I took off. I was glad I went with my running group for support. I got 31:35 which was okay for my first time but I'm targeting getting sub 30 by end of year.